Struggling to find a style after a haircut? There are lots of hairstyles you can do with short hair. 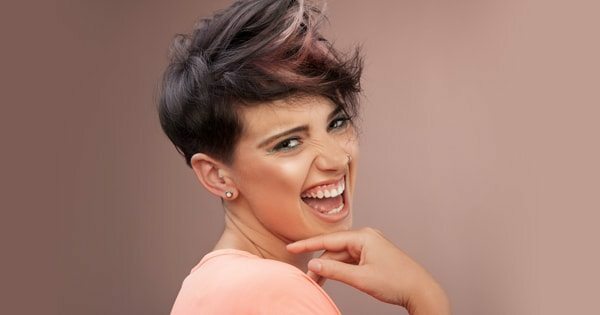 Read on for 5 cute and easy hairstyles for short hair. There are plenty of reasons why cutting your hair short is a good idea. You can be in and out of the shower in minutes. After a quick blast from the hairdryer, you can be out the door and on your way to work. But, many people complain that short hair isn’t versatile. Whether it’s a bob or pixie cut, you might think there’s not much you can do to style it. Now a simple ponytail isn’t even an option! That couldn’t be further from the truth. Struggling to find a style after a haircut? There are lots of easy hairstyles for short hair. Read on for five cute and easy styling options! This style works for a lot of occasions. Wear it at a beach wedding or Sunday brunch. It’s also really functional. The braid works as a headband, holding the hair back. First, part your about two inches past the middle. Choose whichever side you like. Now starting from that part, make another part that is perpendicular. Start that perpendicular part about an inch and half to two inches from your hairline. How far back from your part depends on how thick you want the braid to be. End the part behind your ear. Pull all of that hair forward. You might want to secure the rest of your hair in an elastic so it doesn’t get in your way. Now, spray the hair you’re braiding with a texturizing spray or dry shampoo. When it’s dry, muss up the hair a little. If you have very fine hair you might want to tease it a little with a comb. From the first part you made, you’ll start French braiding. Take about a half-inch of hair and separate it into three groups. Braid those three strands. Then without letting go of those three strands, pick up three more strands from the next half inch of hair. Separate that into three, and add them to the strands you just braided. You’ll still have three strands but with double the hair. Braid those once, and repeat the last step. Repeat until you get to your ear. Now, tuck the remaining hair behind your ear and secure with two bobby pins. This is a style worn by actress Evan Rachel Wood, a woman whose short hair always looks fab. She loves easy hairstyles for short hair. Someone with a pixie cut that’s on the longer side can rock this look. It’s sultry and perfect for a big night out. To try it yourself, start with damp hair. Add some styling mousse to give it body. Blow dry the top of your hair with a round brush to add volume. You can dry the side with your fingers or a paddle brush. Using a 3/4-inch curling iron, curl the top of the portion of your hair into waves. Now, part your hair to one side so all the wave falls to the other. Gently comb the waves. This will soften them and group them together to form the front swoop. Smooth back the hair on the opposite side and tuck behind your ear. Lock it all in place with a spritz of soft-hold hairspray. This is one of the most trendy, easy hairstyles for short hair. Besides being super simple, it’s also a great everyday look. If you’ve missed being able to throw your hair into a ponytail, this is a great substitute. Spray some dry shampoo or texturing spray into your dry hair. When the spray is dry, work the spray through your hair with your fingers. Now with your fingers loosely part your hair on both sides around the crown of your head. Don’t part your hair anywhere past your temples. Take all of that hair and loosely tie it with a hair band at the back of your head. You can leave it like that as a ponytail. If you want the topknot, twist the hair together in a messy bun and secure it with a bobby pin. For this style, you’ll need to have at least short bob-length hair. If you’re looking for easy hairstyles for short hair that you can wear out to dinner, this is perfect. Like the other styles, build texture in dry hair by spraying it with dry shampoo. Part your hair to one side, about an inch from the middle. Loosely gather all of your hair at the nape of your neck. Don’t be afraid if it’s a little messy. Now twist the hair in a bun (as much as you can depending on your length). Secure it with a couple of bobby pins. If you’d like, add a cute headband. You can also use a silk scarf like a headband and tie it underneath the chignon. This is lovely for very short hair as long as you have a little length to play with on top. The singer Pink loves this style. The Poofy Pompadour is chic, yet keeps your hair out of your eyes. Prepare your hair when it’s wet. Apply volume enhancing spray or mousse. Dry your hair back with a round brush. If you still need more volume, you can gently tease your hair up and back. Curl back your hair with a small curling iron. Spray the top with hairspray, and slick back the sides with a pomade. Want to Try These Easy Hairstyles for Short Hair? Trust us, they’ll take less time than you think! That’s the beauty of having short hair. From washing and drying to styling, it’s all quick and easy. Just get a great cut and have the right products. Then, a chic look is something you can achieve on your own every day. If you’re ready to take the plunge and take off a few inches, book an appointment with us! Too nervous to commit to short hair, but still want a change? We also do hair coloring and makeup application. Let’s shake up your look!